For other places with similar names, see Castoria (disambiguation). For the racehorse, see Kastoria (horse). Kastoria (Greek: Καστοριά, Kastoriá [kastoˈrʝa]) is a city in northern Greece in the region of Western Macedonia. It is the capital of Kastoria regional unit. It is situated on a promontory on the western shore of Lake Orestiada, in a valley surrounded by limestone mountains. The town is known for its many Byzantine churches, Byzantine and Ottoman-era domestic architecture, fur clothing industry, and trout. The name "Kastoria" first appears in 550 AD, mentioned by Procopius as follows: "There was a certain city in Thessaly, Diocletianopolis by name, which had been prosperous in ancient times, but with the passage of time and the assaults of the barbarians it had been destroyed, and for a very long time it had been destitute of inhabitants; and a certain lake chances to be close by which was named Castoria. There is an island in the middle of the lake, for the most part surrounded by water; but there remains a single narrow approach to this island through the lake, not more than fifteen feet wide. And a very lofty mountain stands above the island, one half being covered by the lake while the remainder rests upon it." (Procopius "Περί κτισμάτων" /On buildings, book IV,1.3) Although Procopius refers to it as "a city of Thessaly", the description is undoubtedly that of Kastoria, a city on a promontory in a lake. There are several theories about the origin of the name Kastoria. The dominant of these is that the name derives from the Greek word κάστορας (kástoras, meaning "beaver"). Trade in the animal's fur, sourced from nearby Lake Orestiada, has traditionally been an important element of the city's economy. Other theories propose that the name derives from the Greek word κάστρο (kástro, meaning "castle"; from the Latin word castra) or from the mythical hero Κάστωρ (Kástōr), who may have been honoured in the area. The word is sometimes written with a C, Castoria, especially in older works. From Greek, the name was borrowed into Turkish as Kesriye. The Serbian, Bulgarian and Macedonian name of the city is Kostur (Cyrillic: Костур). The municipality has an area of 763.330 km2, the municipal unit 57.318 km2. Kastoria is believed to have ancient origins. Livy (XXXI, XL) mentions a town near a lake in Orestis, called Celetrum, whose inhabitants surrendered to Sulpitius during the Roman war against Philip V of Macedon (200 BC). The ancient town was possibly located on a hill above the town's current location. The Roman Emperor Diocletian (ruled 284–305 AD) founded the town of Diocletianopolis in the vicinity. Procopius (De aedificiis, 4.3.1-4) relates that, after Diocletianopolis was destroyed by barbarians, Emperor Justinian relocated it on a promontory projecting into Lake Orestiada, the town's current location, and "gave it an appropriate name", perhaps indicating that he renamed it Justinianopolis. Th. L. Fr. Tafel, in his study on the Via Egnatia (De via militari Romanorum Egnatia, 1832), suggested that Celetrum, Diocletianopolis and Kastoria are three successive names of the same place. The church of Panagia (Koumpelidiki) (9th or 10th c.). The church of Three Saints (15th c.). The church of St Nicholas Kasnitzes (12th c.). Kastoria itself does not appear, however, until the Byzantine–Bulgarian wars of the late 10th/early 11th century (the mention of Diocletianopolis in Constantine Porphyrogennetos' De Thematibus is anachronistic, drawing from the 6th-century Synecdemus). The town was in Bulgarian hands until 1018, when it was conquered by Basil II. Kastoria was occupied by the Normans under Bohemond I in 1082/83, but was soon recovered by Alexios I Komnenos. The town had a significant Jewish presence, most notably the 11th-century scholar Tobiah ben Eliezer. During the 13th and 14th centuries, the town became contested between several powers and changed hands often. The Second Bulgarian Empire held the city under Kaloyan and Ivan Asen II, until it was recovered by the Despotate of Epirus. The Nicaean Empire captured it in ca. 1252, but lost it again to Epirus in ca. 1257, only for the Nicaeans to recapture it following the Battle of Pelagonia (1259). In the early 14th century, Kastoria was part of the domain of John II Doukas, "doux of Great Vlachia and Kastoria". After his death, the town became part of the semi-autonomous domain of Stephen Gabrielopoulos. After the latter's death in 1332/3, the Byzantine emperor Andronikos III Palaiologos took over the town, but in the very next year (1334) it was surrendered briefly to the Serbs by the renegade Syrgiannes Palaiologos. The Serbian ruler Stephen Dushan finally captured Kastoria in 1342/3, taking advantage of the ongoing Byzantine civil war, and made it part of his Serbian Empire. After Dushan's death, Kastoria became the seat of Symeon Uroš. The town came later under the Epirote ruler Thomas Preljubović, and finally under the Albanian Muzaka family, until it was conquered by the Ottoman Empire in the mid-1380s. The Ottoman Turks conquered Kastoria around 1385, but it is unclear whether by force or by an agreement with its Albanian rulers. During the Ottoman period Kastoria acquired a sizeable Muslim population and several mosques and tekkes could be found in the city. According to the findings of Vasil Kanchov, at the turn of the 20th century, the town had 3000 Greek Christians, 1600 Turkish Muslims, 750 Jews, 300 Bulgarian Christians, 300 Albanian Christians, and 240 Roma, for a total of 6190 inhabitants. The city would remain under Ottoman rule (as part of Manastir Vilayet in the late 19th and early 20th century) until the First Balkan War (1912), when Greece took it. The 1913 treaties of London and Bucharest incorporated Kastoria into the Greek state. Following the end of the First World War the bulk of the Muslim element of Kastoria's population was transferred to Mustafapaşa, Turkey during the Greek-Turkish population exchange. During the Ottoman times, Kastoria attracted a multitude of people from across the Balkans and beyond, resulting in a diverse, multi-ethnic community. As a result, the city plan was radically transformed. The different ethnic communities, Bulgarian, Turkish, Greek and Jewish, became centred around separate neighbourhoods or ‘quarters’. Two old Greek lakeside quarters, the “Doltso” (Dolcho) and “Apozari” neighbourhoods, are among the best-preserved and last remaining traditional quarters of the city. These neighbourhoods are characterised by the rich stock of old houses preserved in the shape of autonomous historic buildings, such as the important private mansions or the more humble folk dwellings (‘accessory’ buildings) built between the 17th and 19th centuries. During this time, the processing and exporting of animal furs to Europe created wealth, and city mansions, of particular architectural and decorative value, were built. This interconnected nexus of churches and private houses constitutes a rare example of a Byzantine and post-Byzantine township, and remains inhabited to this day. The traditional buildings and manor houses of the “Doltso” and “Apozari” neighbourhoods are threatened by modern development in the city, as well as structural degradation from poor levels of conservation. These sites were included on the 7 Most Endangered list of Europe’s most at-risk monuments and sites in 2014. During both World War II and the Greek Civil War, the town was repeatedly fought over and heavily damaged in the process. It was nearly captured by the Communist Democratic Army of Greece in 1948, and the final battles of the civil war took place on the nearby Mount Gramos in 1949. The first Jewish community was a community of Romaniote Jews. One of them was Tobiah ben Eliezer. In 1940 the Jewish population in Kastoria numbered 900, composed predominantly of Ladino-speaking Sephardic Jews. Many family names were of Italian origin as a result of emigrations (originally from Spain) via Italy in the 17th and 18th centuries. In late March 1944, under Nazi German occupation during World War II, 763 Kastorian Jews were taken prisoner by Nazi troops and sent to Auschwitz-Birkenau, as part of a program of deliberate extermination of Jews during the Holocaust. Kastoria was liberated by the guerrillas of the Greek People's Liberation Army less than 4 months after the Jewish citizens were forced to the concentration camps. By the end of the war in 1945, only 35 of the original population had survived, the vast majority of the community having been killed in concentration camps. In 2016, a special documentary titled "Trezoros: The Lost Jews of Kastoria]" was released with never before seen footage. It has been created by executive producer and director Lawrence Russo (based on his parents' story) and co-director and producer Larry Confino. Kastoria is a popular tourist destination and an international centre of fur trade, having taken so the nickname the city of the fur traders. Tourism and the fur industry dominate the local economy. Indeed, (as mentioned above) the town was possibly named after one of the former staples of the trade – the European beaver (kastóri in Greek), now extinct in the area. Trading in mink fur now predominates and every year an international showcase of fur takes place in the city. Fur trade is the biggest factor of Kastoria economy and it started back to the 14th century when the city provided the ermine pelts for the lining of the robes of the Byzantine courtiers. Early traders settled in Russia and Germany. After Germany's division at the end of World War II, the fur center moved from Leipzig to Frankfurt. During the Greek Civil War in the late 1940s, thousands of Kastorians migrated to the United States to take the place of aging Jewish immigrants who had formed the core of New York furriers. In 1984, 25,000 Kastorians were working and living in the area of New York, and 10,000 in Frankfurt. Now there are more than 300 small and big dealers in fur in Kastoria. Other industries include the sale and distribution of locally grown produce, particularly wheat, apples, wine and fish. Recently a large shopping center has been built in the city of Kastoria. Kastoria has 16 local radio stations, 2 TV stations, 5 daily newspapers and 7 weekly ones. The town's airport is named Aristotelis Airport. Kastoria is an important religious centre for the Greek Orthodox Church and is the seat of a metropolitan bishop. The Metropolis of Kastoria is one of the metropolises of the New Lands in Greece, administered as part of the Church of Greece. Kastoria originally had 72 Byzantine and medieval churches, of which 54 have survived, including St Athanasius of Mouzaki. Some of these have been restored and provide useful insight into trends in Late Byzantine styles of architecture and fresco painting. Kastoria used to have two Bektashi tekkes and three Bektashi türbes. The first was situated at the entrance to the town on the road from Florina and was said to be particularly "ancient" and formerly important. It suffered during the 1826 persecution. Its chief saint, buried there, was one of the early Bektashi missionaries named Kasim Baba who is said to have lived during the time of Turkish conquest and, according to folk history was a "posthumous miracle worker" and converted many local Christians by causing a huge rock to crash into the local church. However this tekke was suppressed under a Sunni crackdown in the 19th century. Another notable tekke was located at Toplitza, near the barracks, and contained a turbe with the grave of a local notable Sandjakdar Ali Baba. There was also a turbe on the outskirts of the gypsy quarter to Aydin Baba. The Museum of Byzantine History located on Dexamenis Square houses many examples of Byzantine iconography. The Costume Museum and the Monuments Museum are also located in the city. In the village of Kastanofyto lies the Folklore Museum (Kastanofyto), which preserves folk traditions from the local area. Kastoria is filled with old manors dating to the Ottoman period, while parts of the old Byzantine walls also stand. Stone bridges are an important part of the traditional architecture of Kastoria. The best known is the bridge of Zouzouli, the bridge of Koromilia, the Koutsoumpli bridge and the bridge in Beriki. The Bridge of Zouzouli, located in a remote area on the southern tip of the prefecture of Kastoria, is built over the waters of the stream of Zouzouli and connects mt. Smolikas with mt. Voios. It is arched, has a length of 25 meters and a height of 7 meters. Constructed in 1880 by artisans coming from Konitsa. The construction was financed from either a man, in memory of his brother who drowned in the river, or from a ruler who, moved by the drowning of a little girl, wanted to build the bridge. The bridge of Koutsoumpli is located between the mountains of Voio and Smolikas, over the river of Zouzouli and it previously connected the villages of Eptachori and Zouzouli. Its arch is 14 meters wide, 8 meters high and it has a total length of 33 meters and a width of 2.40 meters. The bridge in Beriki has a very thin arch and a great height. It was manufactured by master builder Sdrolios, who came from the village of Ntempeni (now Dendrochori), probably in 1866. Next to the bridge there was possibly a watermill and an inn. Probably, this is where the name of the region came from (inn Beriki). The bridge of Koromilia is built over the Ladopotamos river and it used to connected the village of Koromilia with the one of Dendrochori. It is arched and has a length of 26 meters, a width of 2.80 meters, a height of 7 meters and an arch opening of 16 meters. It was built in 1865 and consists of limestone and schist slate. Kastoria FC is the town's football team. It was established in 1963 when three local sides joined to form one stronger team representing the town. The team's most successful years to date were 1974 when it was promoted to the Greek first division and competed there for a year, and then 1980 when it won the Greek Cup after an impressive 5-2 victory over Iraklis FC in the final. The team are hoping to return to the first division this year as they are currently competing for the second division (Beta Ethniki) title. Qazim Baba, 15th century Muslim bektashi holy man. ^ a b K., Darling, Janina (2004). Architecture of Greece. Westport, Conn.: Greenwood Press. ISBN 0313321523. OCLC 54500822. 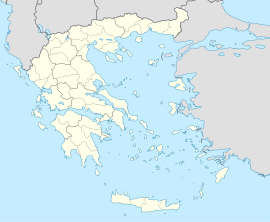 ^ "Καστοριά - Προέλευση Του Ονόματος (Kastoria - origin of the name)" (in Greek). Δήμος Καστοριάς (City of Kastoria). Retrieved 2008-10-29. ^ "K". The Oxford English Dictionary, 2nd ed., 1989, online". dictionary.oed.com. Retrieved 2017-07-15. ^ a b c d e f g h i Gregory, Timothy E.; Wharton, Annabel Jane (1991). "Kastoria". In Kazhdan, Alexander (ed.). The Oxford Dictionary of Byzantium. Oxford and New York: Oxford University Press. pp. 1110–1111. ISBN 0-19-504652-8. ^ "Kastoria". jewishvirtuallibrary.org. Retrieved 2017-07-15. ^ Machiel., Kiel, (1990). Studies on the Ottoman architecture of the Balkans. Aldershot, Hampshire, Great Britain: Variorum. p. 303. ISBN 086078276X. OCLC 22452904. ^ a b c "The Holocaust in Greece". United States Holocaust Memorial Museum. Archived from the original on 2009-05-06. Retrieved 2009-09-29. ^ "Wiped out 'in the blink of an eye': Only 35 Jews survived from a 2,000-year-old Greek community". The Times of Israel. Retrieved 2016-11-27. ^ Zikakou, Ioanna. "This Town Could Die from the Russian Import Embargo to Greece | GreekReporter.com". Retrieved 2019-03-25. ^ a b Granitsas, Margot (1984-06-03). "Kastoria, City of Mink". The New York Times. ISSN 0362-4331. Retrieved 2019-03-29. ^ "About us - Real Fur Coats, Vests, Keychains, Slides and Hats". hauteacorn.com. Retrieved 2017-07-15. ^ "ραδιοφωνικός χάρτης | Ραδιόφωνο (Greek radio stations, Kastoria)". radiofono.gr. Retrieved 2017-07-15. ^ "Εφημερίδα Μακεδονία | Η εφημερίδα της Θεσσαλονίκης (Makedonia newspaper, article of 2008/06/29 by Dimitra Tsapodimou)". makthes.gr. Retrieved 2017-07-15. ^ a b Hasluck, F. W.. | Geographical Distribution of the Bektashi. The Annual of the British School of Athens, vol. 21, pp 84-124. Pages 106-107: "Kastoria.-- The tekke is situated at the entrance to the town on the Florina road. It is now small and insignificant ... but is said to be ancient and formerly important. It suffered during the persecution of 1826. The chief saint buried here, Cassim Baba, is supposed to have lived at the time of the Turkish conquest, and enjoys considerable local fame as a posthumous miracle-worker. He is said during his lifetime to have converted many Christians by the somewhat crude method of hurling from the hill... a huge rock, which crashed into a church full of worshippers. Of a second tekke, occupied within living memory, at Toplitza (near the barracks) only the turbe and grave of Sandjakdar Ali Baba remain. The Bektashis also lay claim to the grave of Aidin Baba, in a humble turbe on the outskirts of the gypsy quarter." ^ Kingsley Birge, John (1937). The Bektashi Order of Dervishes. Luzac. p. 72. ISBN 9789333459358. ^ "Plovdiv has yet another sister city". Retrieved 2015-03-01. Wikimedia Commons has media related to Kastoria.